Now that we’ve launched Fridgg, I’m a little more conscious of being on top of holidays before they happen (unlike how I always used to post holiday recipes a week or so after the fact!) For example, I got the Halloween sushi post up a couple of days before Halloween, and here I am with a Thanksgiving post a whole two weeks before Thanksgiving (so long as you don’t count the Canadians)! Of course, I can’t take all the credit for having this one posted early. Last weekend there was a Food Bloggers Los Angeles meeting (they have one every month) at Andrew Wilder’s house, and we were all asked to bring a Thanksgiving dish, so I had no choice but to come up with something! I considered bringing sushi, but decided I didn’t want to bring an experimental roll that might not have been any good (I didn’t have time to test out any roll ideas before the day of the meeting). I thought about bringing the pie I always make for my family’s Thanksgiving gatherings, but figured there would probably be plenty of other people bringing pies. But I got stuck on the idea of a pie-based dessert. Since I wanted this to go on Sushi Day, I wanted something somewhat Asian. Because obviously, if you put it in a wonton, that makes it Asian. And, as we all know, I like to put stuff (like cheese and jalapeños, or arctic char and cream cheese) in wontons. 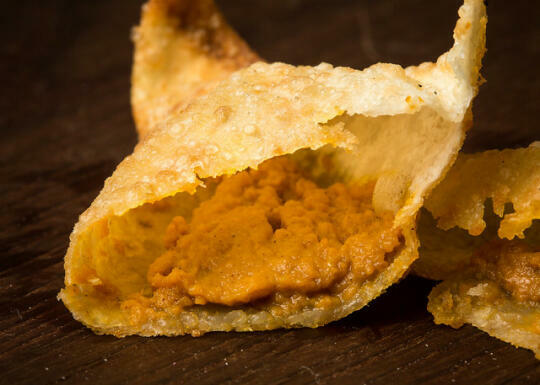 Thus, pumpkin pie wontons! I daresay this is my best wonton idea yet. 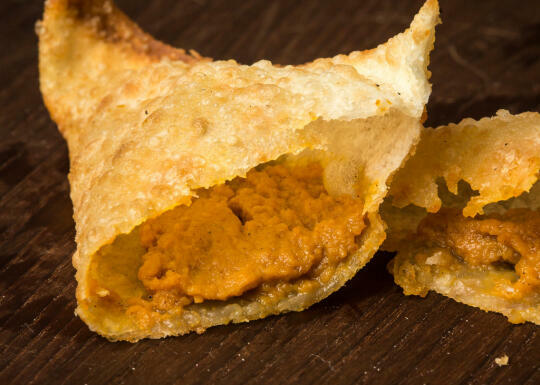 They taste like little, light, pumpkin hand-pies. And the maple whipped cream (which was Son’s idea) really pushed them over the top. And now that I’ve made these, I really want to try other pie fillings in wontons… perhaps apple? 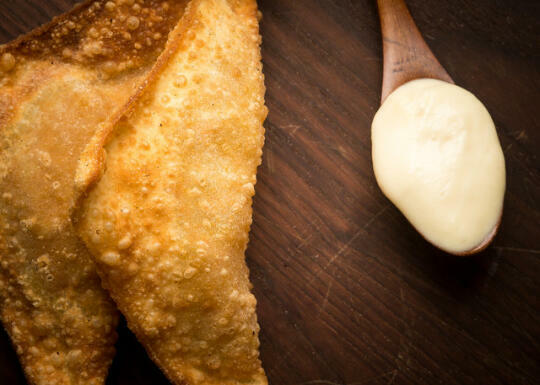 What sorts of pie fillings do you think would work well in a wonton? The pumpkin pie filling is from the Thanksgiving Twofer Pie recipe in Baking From My Home To Yours by Dorie Greenspan. I got the whipped cream recipe from Back to Her Roots. Mix the pumpkin puree, 2/3 cup heavy whipping cream, brown sugar, egg, egg yolk, vanilla, cinnamon, ginger, salt, and rum in a mixing bowl. Place one wonton on your clean working surface with one corner pointing towards you, and use your finger dipped in water to wet all four edges. Place a small scoop of the pumpkin pie filling in the middle of the wrapper. Bring the top and bottom corners of the wonton wrapper together, and then seal the edges, pressing firmly to make sure all the edges seal well (you don’t want the filling leaking out while you fry them). Repeat with the remaining wonton wrappers and pumpkin pie filling, until you run out of one or the other. Pour about 2 inches of cooking oil into a cooking pot or wok, and heat it on high. 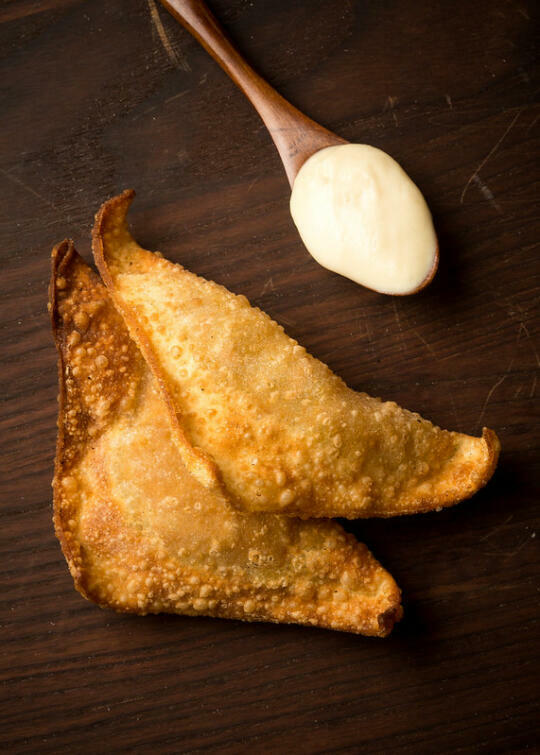 Serve wontons with dollops of whipped cream immediately (wontons will get soggy if you let them sit for too long, but they’ll still be delicious!). Put any leftovers in the fridge, and reheat using a toaster oven. If you have leftover wonton wrappers, you can cut them into strips and fry them for chinese chicken salad, or fry them and top with powdered sugar for a light, delicious dessert. If you have leftover pumpkin pie filling, you can use it for this pumpkin pie parfait. I’m not a big fan of pumpkin (my pumpkin cheesecake and my brother’s pumpkin fudge are the only exceptions) but these wontons with their maple cream dip look like they would be a tasty treat for Thanksgiving as well as the entire fall season. I tried making this and the “filling” was…completely liquid. Did you mean one CAN of pumpkin? Unegen – No, the recipe is correct as written. The filling starts out more liquid than solid (although I wouldn’t consider it to be *completely* liquid), so you have to make sure you seal the wontons well. It becomes much more solid when it’s fried. I love this recipe, Allison! 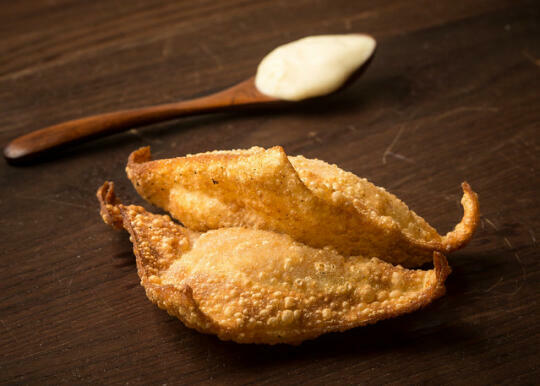 It resembles pastel frito or fried empanadas. I think that the pumpkin filling adds a real comforting element to the recipe. Tried the recepie.. It doesn’t look like in the pictures but it still tastes good. Thanks!